One thing we have both recently gotten into is an app for our iPhone called Plant Nanny. This app has majorly helped us to keep on track when it comes to water intake. The purpose of this app is to not only ensure you get your recommended water intake everyday but to also keep your cute, loveable plant alive. Do we need a refresher on the benefits of water? We’ve both gone through about 3 plants now and we find it fun to plant new ones and watch them as they grow/evolve. The plant will go through 4 levels until they completely evolve and you can move them over to your display and collect seeds from them. With these seeds you get to buy new and better/more difficult plants! Doesn't that make you sad? Thankfully that sad face went away by 3pm of the same day! Here is also a chart that tracks your water intake daily"
Overall this app is a lot of fun and really does help you to increase the amount of water you consume in a fun way! It kind of feels like a game. One thing we will say as a warning... be prepared to PEE!! 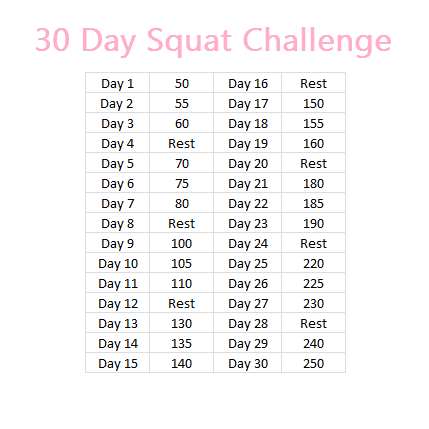 Together we have decided to do the 30 Day Squat Challenge! There is nothing better than having your friends for motivation; we encourage you to read on and join us! Doing a 30 day squat challenge is something almost anybody can do, and will benefit just about everyone. You start by doing 50 squats on day 1 and slowly increase to a maximum of 250 squats by day 30. Please click on this link to watch a very helpful video that shows you proper form and technique. Jenn: This will be my second time taking on this challenge. I love the result and strength I felt by doing this. Please refer to my past posts if you’d like to read about my first experience. I am ready to start round 2! I recommend that you take your time doing the squats and do them properly, that way you will get the best results. They will hurt and burn, but it gets easier! Don’t give up. Steph: This is my first time doing the challenge. I am a bit nervous but excited at the same time. I finished my first day of squats a few hours ago and I am still burning. A good burn :). I am excited to push myself on this challenge and see results! Plus I’m very excited to be able to do this with my best friend! She is my motivator on this one. Get your squat on and be sure to let us know if you’ve decided to do the same so we can use each other for support! I did it!!! I didn't eat any fast food for over 30 days straight. Guess what? I'm not even craving any and doubt I will eat any today because meh.. why bother? I don't need it! The first week of this challenge was BRUTAL for me. I craved fast food every single day. If it wasn't "Mmmm I really, really, reallllly want a chicken caesar pita" it was "I should stop off at McDonalds and get some breakfast burritos." I craved pizza, shawarma.. everything. Within 2 weeks those cravings had completely gone away and I was left counting the days. I was really struggling before and doing this not only helped me kick the habit and craving.. it helped me out financially. I wonder how much I saved by not eating out a couple times a week? Maybe around $80? I've never understood people who ate out every single day.. so why would I become one? Here's to healthier meal decisions! SO! I've decided to start another 30 day challenge.. TODAY! Details about that will be posted later this evening and it's an extra, extra, extra special one :). I'm a little nervous about this challenge... but with faith comes strength! Just need to believe in myself and I KNOW it will be successful. I am obsessed with a salad right now and can’t seem to get enough. Remember it's good to change it up, eating the same foods can get boring and cause you resort to eating fast food for a change. I encourage you to try new recipes and keep your healthy meals exciting! I use baby romaine and baby spinach, mixed together equaling 2 cups. 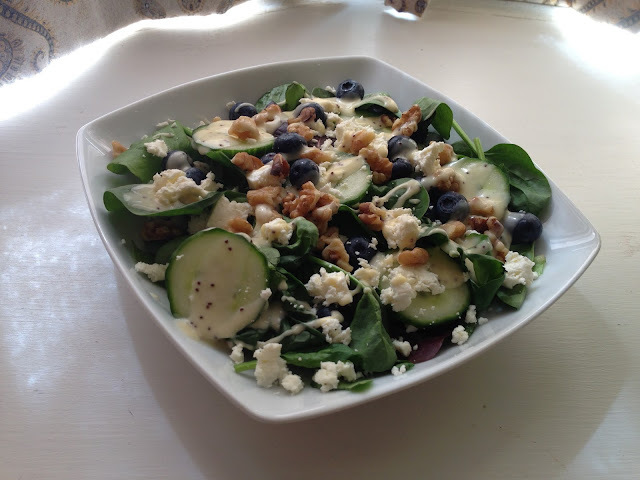 Topped with; 2tbsp walnut pieces, 2tbsp crumbled feta cheese, 1/4 cup cucumber, 1/4 cup blueberries, and (Kraft: calorie-wise) 2tbsp creamy sesame seed dressing. YUM! Drooling just thinking about it. Adding chicken pieces is also very good. This salad is approximately 175 calories without chicken. As I mentioned in our week in review.. times have been tough on me lately. Financially, physically and especially emotionally. I’m generally a fairly healthy person and in the past was almost never sick. If I was it was a slight cold that took care of itself in a week or two. It’s time folks. It’s time for me to listen to my body and take my health more seriously. Just because I’m feeling down doesn’t mean my body has to pay for it. I’ve done this before and I DO NOT want to balloon up to 250 lbs again. That is just not an option anymore. I’m doing better by eating cleaner and planning ahead but I need to curb my night time snacking and focus on being more active. Here’s to a work in progress! I have discovered an amazing moisturizing mask and can’t keep it a secret, I need to share this with all of you. 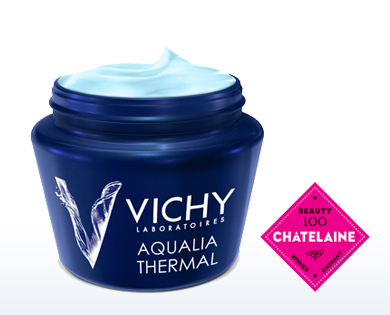 I have been using the Vichy products for some time now with great results and with my last purchase I received a sample pack of the Vichy Aqualia Thermal Night Spa Mask. My skin has improved tremendously, within the past three nights using this mask. I can’t believe the difference! My face feels silky soft, hydrated, and amazing. The bumpy irritation that I often get diminished overnight. The scent is very light and pleasant, and the product feels fresh on your skin and glides on smoothly. I love that it’s enriched with minerals and helps the skin with regeneration. Typically this would be used 3-4 times a week before going to bed and always applied on clean skin. It has been replacing my night time moisturizer, this product is a definite must have! Thanks for reading, now go pick up your own personal spa in a jar… Or at least try the sample at Shopper drug mart! Jenn: Hello all, I’m baaack! I have been working on my water intake after Steph told me about this app called “Plant Nanny”, I suggest you check it out. I was only drinking half of what I was suppose to, it’s a big eye opener. Plus, the app is super cute and fun. 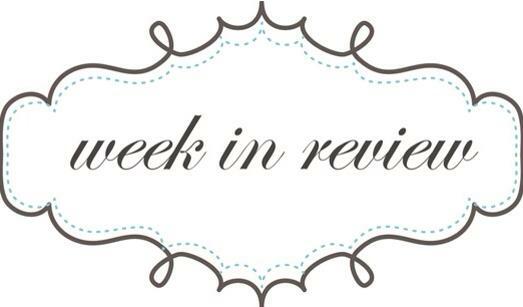 I have been focusing on tracking this week and eating better, it feels good to be healthy. Since I have been drinking so much water I am definitely feeling less hungry and don’t have as strong of an urge to snack at night. I am going through a difficult stage with Noah lately, I think it’s his age. He is learning what “No” means and doesn’t like the word. Since he can only say some words, his communication is whining when he wants something or is upset. I just look forward to him being able to express himself in words and understand. Steph: Hi all, just wanted to start this off by saying I’ve been having a bit of a stressful time which I will go into more detail about later this week. Times are just tough on me right now and I’m just pulling back in so many ways. I need to get over this hump and move forward. Anyways...I’ve actually been doing quite well with my eating and have been eating MUCH cleaner! MUCH, MUCH, MUCH cleaner! It feels good and my body does feel better. I’ve still been making very healthy lunches for Pete and I and we’re both enjoying that. Pre Planning and ensuring you’re prepped for the week really makes things much easier! Plus usually I hate salad but I’ve really been spicing them up so they’re enjoyable! I’ve also noticed this week that I was not getting NEARLY enough water. I decided I wanted to try out an app to improve and really disliked the one I had downloaded lol. I ended up trying one my friend had posted about on Instagram last week and quickly fell in love! It’s so cute! Plant Nanny has helped me soo much with my water intake and I actually WANT to drink just so my cute little plant doesn’t die. It also evolved which makes it extra fun :). It costs $1 but oh well.. it works!